"So from time to time I stop working, I wander around in the streets, I go into a bar, I observe what's happening in town and I gossip with the old man who sells me my lunch-time sausage because the Dragon-it's high time I introduced you to him-is a kind of moving house or seashell on wheels that my obsessive love for Wagner impelled me to call Fafner. 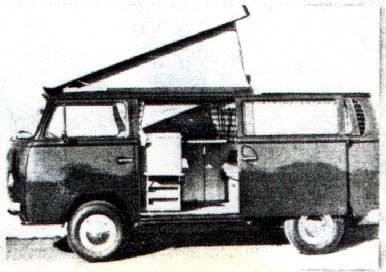 A red Volkswagen with a water-tank, and a seat that lets down into a bed. I have added a radio, a typewriter, books, bottles of red wine, packets of soup and cardboard mugs. Plus swimming trunks for whenever the opportunity arises, a lamp and a gas-ring that turns tinned food into a meal while I listen to Vivaldi or pen these words. "This stuff about the Dragon stems from a long-felt need. I have rarely accepted the names that are stuck onto things like labels, and I think this is reflected in my books. I do not see why we should always have to put up with what comes to us from the past and from elsewhere. So I have given to the beings I love and have loved names derived from an encounter, a coincidence between secret codes. So women became flowers, birds or woodland animals. There were friend whose names changed once a cycle had run its course: a bear became a monkey, a pale-eyed woman was a first cloud, then a gazelle and finally a mandrake. Anyway, let's get back to the Dragon. When two years ago I saw him arrive in the Rue Cambronne, fresh from the factory, with his wide red face, lowset sparkling eyes, and laid-back air of bravado, something in me went click and he became the Dragon, and not just any old dragon but Fafner who guarded the treasure of the Niebelungen and who, according to legend and Wagner, is brutal and stupid but has always aroused a sneaking sympathy in me, perhaps because he is doomed to die at the hand of Diegfried. I can't forgive heroes that do that kind of thing: thirty years ago I could never forgive Theseus for having killed the Minotaur (I have only made the connection between these two things today). "On that particular afternoon I was much too busy with the problems I was going to have with the Dragon when it came to changing gear and manouvering-he was much higher and wider than my little old Renault. Now it seems obvious to me that I only obeyed the instinct that always leads me to defend those the established order regards as monsters and exterminates as soon as it can. In two or three days I became the Dragon's friend. I told him that as far as I was concerned his name was no longer Volkswagen. Poetry was, as so often, right on target, for when I went to the garage to have his number plate fastened on and saw the mechanic screw a large F on his backside, I was sure my hunch was correct. And even if the mechanic would have insisted the the F stood for France, the Dragon understood perfectly. On our way home he showed me how delighted he was by enthusiastically mounting the pavement and scaring the wits out of a housewife laden with shopping baskets." * Julio Cortazar (1914-1984), a major Argentine writer whose works translated into English include "End of the Game, and Other Stories" (1967), and the novels "Hopscotch" (1963), "A Manual for Manuel" (1973) and "We Love Glenda So Much" (1980) He wrote this short piece while in living in exile in France.